In most ski resorts chair lifts are the most common way for skiers to ascend the mountain to the top of the pistes. A chair lift is basically lots of seats hanging from a cable, which is held in the air by pylons. The cable revolves around a circuit taking the chairs up and back down the mountain. When you sit on a chair lift you keep your skis on your feet, as you are taken up the mountain. There are several slightly different types of chair lift. Older chair lifts have each chair permanently attached to the cable, making the chairs move at the same speed in all phases of a chair lift journey, whereas newer chair lifts often detach the chair from the cable at the top and bottom so that the chair can be slowed down to make getting on and off easier, as well as enable the chair to travel faster as it goes up the slope. Some older chair lifts use a conveyor belt as you get on the lift, enabling the lift to travel a bit faster. 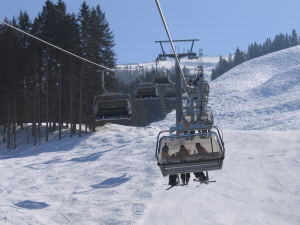 Chair lifts also vary in the number of seats they have, with most chair lifts normally having between 2 and 8 seats. The last major difference there can be is the type of safety bar they have. Most safety bars are pulled down from above, but on some 2 seater chair lifts they swing around from the side. Normally safety bars also have ski rests attached to them, so that you don't have to leave your legs hanging, although in rare cases they don't. Some newer chair lifts also have new added comfort features like heated seats, and clear plastic bubbles that can be pulled down to protect you from the wind and snow. This article is based on the most common type of chair lift, with a safety bar that you pull down from above. As you approach a chair lift there is normally some kind of queuing system, enter the queue if there is one and patiently move with the queue towards the chair lift. As you are queuing take the pole straps off of your wrists. You will come to a set of gates, the gates open and close automatically, to let people through at the right time to get on the chair lift. When a gate opens only one person should go through each gate slot. As soon as the gates open, shuffle yourself through the gate and continue going forward until you get to the line that shows where your ski tips should be. Don't take too long to do this, as the gate will only stay open so long, and you only have so much time to get into position before the chair lift will arrive. Once you are on the line waiting for the chair to arrive, hold both your poles in one hand, and look over your shoulder to see the chair arriving. If it is an old lift, you might also want to put one hand out to stop the seat from hitting you in the legs too hard. As soon as the chair reaches you, sit down on it, lift your skis up gently, and let your skis slide off of the end of the platform. As soon as you are clear of the platform, pull the safety bar down, making sure that everyone on the lift is clear of it first, and rest your skis on the ski rest. While you are on a chair lift simply sit back and enjoy the views while holding your poles in one hand, and resting your skis on the ski rest. If you are on a modern chair lift with a bubble and it is windy or snowing you can pull the bubble down over your head to keep warmer. As you approach the top station you will need to prepare to get off of the chair lift. As you get to within 20 seconds or so of the station, take your skis off of the rest, and let them hang underneath you. Then just as you are coming into the station lift the safety bar up, making sure that everyone else on the chair lift is ready and have taken their skis off of the rest too. In the last few years a lot of chair lifts have had a sign installed to show you where you should lift up the safety bar. Once the safety bar is up you will be entering the top station. If you are on a newer chair lift, the chair will generally slow down here so you have plenty of time to get off, however if you are on an older chair lift, it probably won't slow down as you come into the station, so you will have to be a little bit quicker. As the chair lift arrives at the station make sure you keep your ski tips up, so that they cannot catch on the platform, which would generally pull you off of the chair lift. Chair lifts normally have 2 stages to the top area, a flat area of snow, for you to put your skis down on and get your balance, and a gently inclined area, for you to slide down and get away from the chair lift. As you as you reach the flat area, put both skis on the ground and ready yourself to stand up, still holding both poles in one hand. As you reach the sloped area, stand up and gently push yourself away from the chair lift with your free hand. Then slide away from the chair lift, still with both poles in one hand. Once you have slid away from the chair lift initially make sure you continue to move away from the lift, as more people will be coming and there needs to be space for them to slide away from the lift too. Once you are far enough away from the lift, you can then put you pole straps back on your wrists, and ready yourself to ski off. If you fall over as you get off of a chair lift, if possible try to either get up quickly and continue forwards getting out of the way, or try to shuffle sideways out of the way of the next people who will come off of the chair lift. Chair lift operators are normally very good and will quickly stop a lift if someone has fallen over in the way, so that people don't ski into them. But they cannot always spot everything, and if they do stop the lift, you are delaying everyone else from getting up the mountain. As simple as getting on and off of a chair lift should be there are many mistakes that people make, even people who have been skiing for years. Not moving through the lift gate as soon as it opens - You only have so much time to get into position once the lift gate opens, and on some lifts if you don't move through quickly, you will struggle to get to the line and prepare yourself before the lift comes. Moving out of line after you have gone through the lift gates - Lift gates are normally set up inline with where the seat for you will arrive, but if you veer off to the left or right after going through the gate, you can miss your intended seat and even push people off of the sides as the lift arrives. Not looking out for the lift as if comes from behind you - Older lifts especially can approach quite quickly, and if you are not looking out and ready they can hit you in the back of the legs quite hard. Not taking the pole straps off of your wrists before you move through the gates - As soon as you have sat down if not before, you want to have your poles in one hand. This leaves you a hand free to pull down the safety bar, and to push yourself off at the top. If you still have the straps on your wrists, they are likely to get in the way of the safety bar, and you might even stab people with them if you try and pull the bar down, or move your hands around. Not checking that everyone is clear before pulling the safety bar down - Sometimes people will start to adjust their boots and so on as they get on a lift, and if you pull the bar down you can squash them under it. It's not always possible to see where everyone is, so check quickly and pull the safety bar down slowly and gently, so that you notice if someone is in the way without hitting them with the bar too hard. Not holding onto things while you are on a lift - As stupid as this might sound, you would be amazed at the amount of things people accidentally drop off of chair lifts. Once dropped most things are normally very hard to get back as well. Forgetting to take your skis off of the ski rest before trying to lift the safety bar up - The bar will not come up unless you have taken your skis off of the rest first. Not checking if everyone else has taken their skis off of the ski rest before trying to lift the safety bar up - The bar will either not move or you will lift their legs and skis in the air. Trying to use your poles to get off of the lift - Two things can happen if you do this, one you can put your poles in front of other peoples skis, so that they cannot slide away from the lift, and effectively get dragged under it, falling over. Or you put your pole into the snow before the instant you want to move off, which gets the tip stuck, and the chair continuing to move forward either bends or snaps your pole. You should hold your poles in on hand and not try to use them until you are away from the lift. Not moving out of the way at the top of the lift - Where you stop sliding is also exactly where the next person is going to stop sliding too. You need to make sure you continue to move out of the way, or they might well crash into you as they have nowhere else they can go. Falling over as you get off the chair lift and just lying there - If you fall over, try to get up quickly or get out the way. There will be more people coming in just a few seconds, and you don't want them to either crash into you, or the lift to stop delaying everyone else. Even though there are many common mistakes made on chair lifts, getting on and off of chair lifts is actually very easy and simple. Here are some tips to make everything easier. Take your poles straps off of your wrists before you get to the gates. As soon as the gate opens move forward to the line and watch out for the chair lift, without veering out of line. Check that everyone is ready before you pull the safety bar down. Hold onto your poles in one hand while on the lift, and make sure you don't drop anything. Make sure everyone has taken their skis off of the rest, before pushing the safety bar up. Push yourself away from the chair lift, with your free hand as soon as you get to the inclined area at the top, while holding both of your poles in the other hand. Continue to move out of the way once you are off of the lift, so that the next people don't crash into you. On to the Learning Mentality page.